Tallinn Backpackers was rated #1 in Estonia at the 2010 and 2011 Hoscars and it's not hard to see why. This fun, lively and comfortable hostel 'has a great atmosphere [where it's] really easy to meet people. It's the best hostel if you are travelling alone', according to our guests, who also tell us this is a 'fantastic party hostel, exactly what hostels should be like'. Despite this, the hostel is quiet after 11pm, so it's easy to get a good night's sleep as well. They're located in Old Town, just five minutes' walk from Town Hall Square. The right choice for individual travelers. Top Old Town location, fun and friendly atmosphere, access to activities organised by our sister hostel, and a chill vibe. Clean, secure, relaxed environment for individual travelers in addition to small groups. 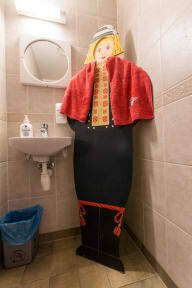 Tallinn Backpackers is well known for its homely and social atmosphere. Our spacious common room is the perfect place to meet up and have a couple of drinks with fellow travelers and our live-in staff. We are happy to recommend activities and fun things to do around town. During the evenings chill out with us, chat to other travelers and staff will be happy to suggest bars and night time spots for every taste. We are located in a beautiful historical building just around the corner from Town Hall Square. A perfect base to explore the city and only a 20 minutes walk from ferry terminals. Easy access to airport, train station and coach station. - Free tips to get out of tourist mode for a day or two and see the weird and wonderful side of alternative Tallinn, handpicked by our in-the-know staff. One of the best hostels we stayed at! We were able to drop off our luggage early. While we were dropping it off, we got some really great advice on where to go and some great food advice! All of the staff there was super friendly and welcoming. Great location, great hostel environment, comfortable clean beds, clean bathroom. Perfectly located in the Old Town. Comfortable beds. Friendly staff. The common room is very spacious and there I met other travellers whom I beat at foosball! Ha! Very good hostel, near the city center which is only 5 minutes away. Stayed with 8-person group in private room with own sauna (which unfortunately did not work). Very clean rooms and good common area. I'd really recommend to stay here! The location is great and the atmosphere is just perfect, I met the most lovely people here! The rooms are average, but the common room is very big and perfect to hang around, the kitchen is clean and the bathrooms are huge and very clean. I really enjoyed my stay here and would recommend this place to everyone who wants to visit Tallinn for a few days. I think what makes us special is that we don't allow large groups to book into our hostel, so we have the ability to have one-on-one contact with each and every guest. We really try to make everyone feel like family, and will all our local knowledge we can guide anyone in the right direction for what Tallinn has to offer. Each night a staff member cooks a hostel dinner for only â'¬3 per serving and they even clean the plate for you! This is a good start before it's time to hit up our small bar for happy hour, but don\'t be careless after 7.30pm when the only rule of the hostel comes into play... Facebook Violation; during happy hour Facebook is banned in the common room, allowing for more group interaction. 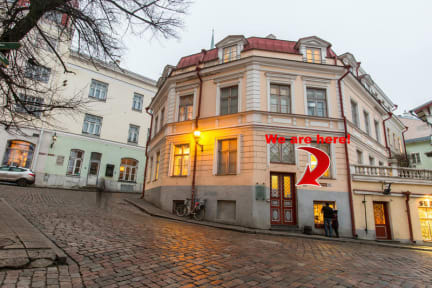 We're located in the middle of Tallinn\'s historical Old Town, only an arms length away from all the main attractions. One place all staff recommend is \'III Drakon\', a real medieval tavern that serves elk soup with generous pies and the right beer for so cheap that you can buy for your friends as well. All servings are â'¬1 and the service stays true to medieval times, so this should not be missed.